Hope Studios: Why don't you ... Advertise with Hope Studios? Why don't you ... 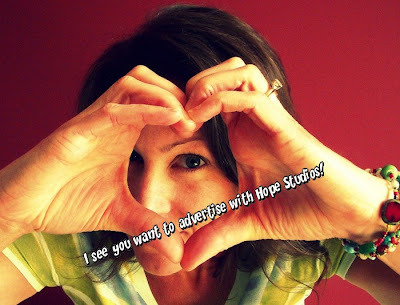 Advertise with Hope Studios? Get some extra exposure for your Etsy shop or business by advertising here! I have 3 spaces this month for the affordable rate of $15 for the month of November. I have been lucky enough to build readership here and it has blessed my business - let me do the same for you! Want a whole post all to yourself? I'm scheduling Tutorial Tuesday giveaways again for anyone interested. $10 buys you a whole day of front page advertising and lots of exposure. I'm here to testify to the fact that my advertising button on Jennifer's blog gets me more traffic than my other buttons on blogs with 3x as many followers. It is the best $15.00 I have spent this year and I am happy to continue to play with Jenn. If you own a small business, I strongly urge you to consider joining us...you won't be sorry. Jenn is so down to earth and always there to help your home based business grow. She is one of us(home artist) and because of that she understands how to market our creations. So come on...sign up before the spaces are gone! Janet, that was a very nice testimonial! As the magic Sitar said in the movie 'Moulin Rouge'..."I only speak the truth!"